Order independent transparency (OIT) proves challenging for modern rasterization-based renderers. 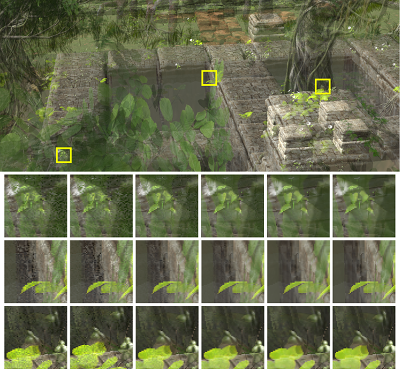 Rendering without transparency can limit the quality of visual effects, so researchers have proposed various algorithms enabling and approximating OIT. Unfortunately, this work generally has restrictions limiting its applicability. To identify directions for improvement, we performed an in-depth categorization of existing transparency techniques and placed them on a multi-dimensional continuum. This categorization shows how prior published techniques relate to each other and highlights unexposed parts of the continuum where further research may prove beneficial. We also describe two new OIT algorithms that occupy previously unexplored regions of this continuum. These novel algorithms include stochastic layered alpha blending (SLAB), which provides a parameter to explicitly transition along the continuum between stochastic transparency and k-buffers, and multi-layered coverage blending (MLCB), which explicitly decorrelates visibility and opacity in multi-layered alpha blending.